“ERGON” is a Greek word that means work, vocation and the product of work. ERGON started off as a family business in Thessaloniki (with three generations’ worth of experience in the food sector) with the goal of promoting unique Greek products. From their dealings with farmers and producers from all over Greece, they realised that there is a need to establish a unifying brand that would guarantee the overall quality of a broad and diverse product range, and ERGON was thus born. 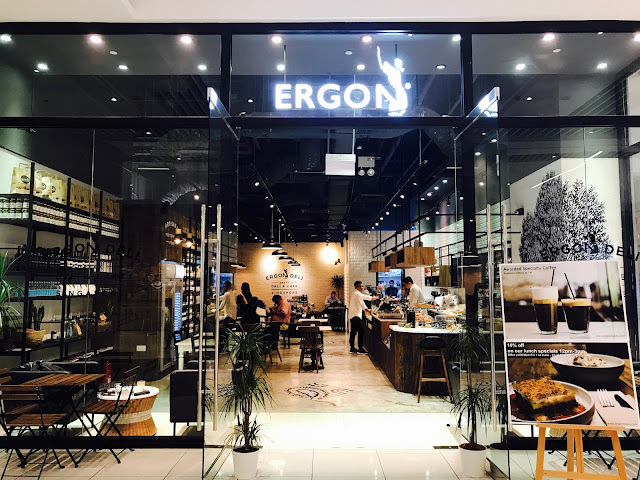 ERGON aims to promote the Greek cuisine through retailing of ERGON products in selected retailers and outlets in Greece and abroad. ERGON products are sold at 300 outlets in Greece and they also have the presence in some European countries such as France, United Kingdom, Belgium, Luxembourg, Germany, Cyprus, Serbia and Poland. 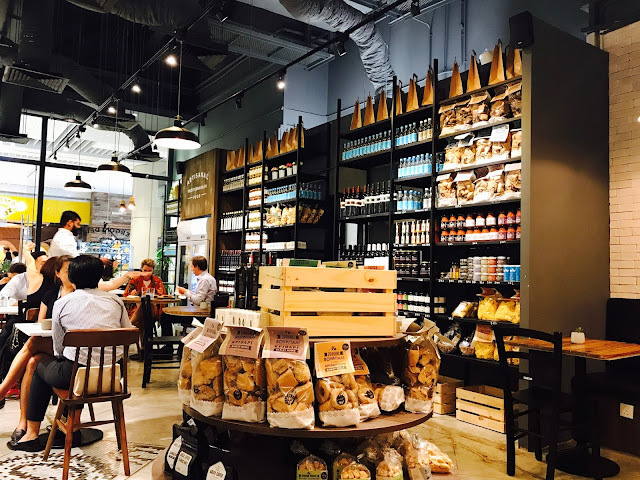 This outlet in Suntec City is their first venture in Singapore. 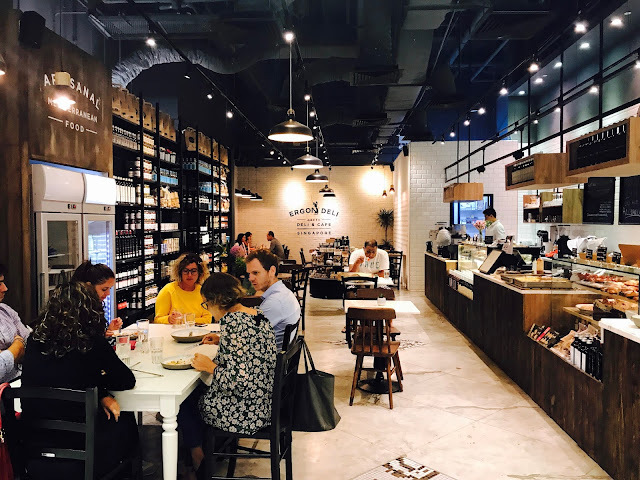 The cafe is spacious with wooden tables and chairs, the warm white lights brighten up the earth-toned interior. There are ample seats and sofa to comfortably accommodate 30-40 people with wide berths between tables so you won’t have to worry about knocking over things. 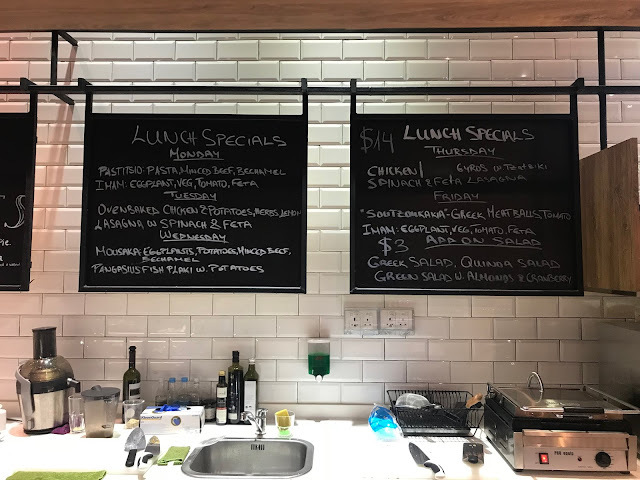 Besides the Brunch Menu and the full-fudge menu, ERGON also offers lunch specials where the dish changes every day of the week. 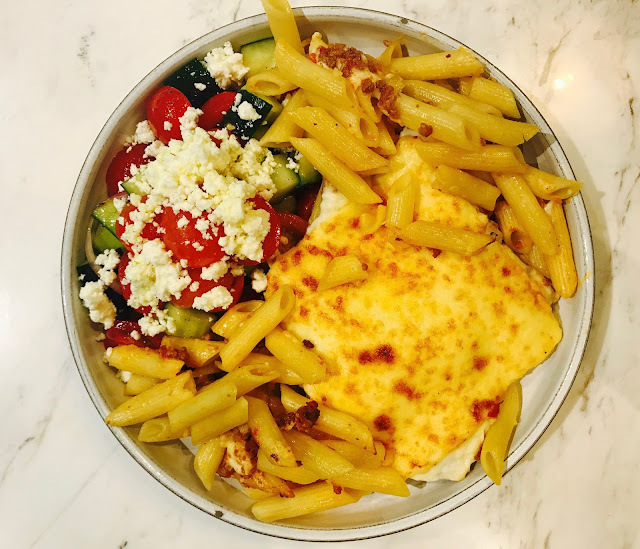 For example, on Tuesdays, you have a choice of Oven-baked Chicken & Potatoes, Herbs, Lemon or Lasagna with Spinach & Feta while the menu for Fridays is either Soutzoukakia (Greek Meatballs with Tomato) or Imam (Eggplant, Vegetable, Tomato, Feta). 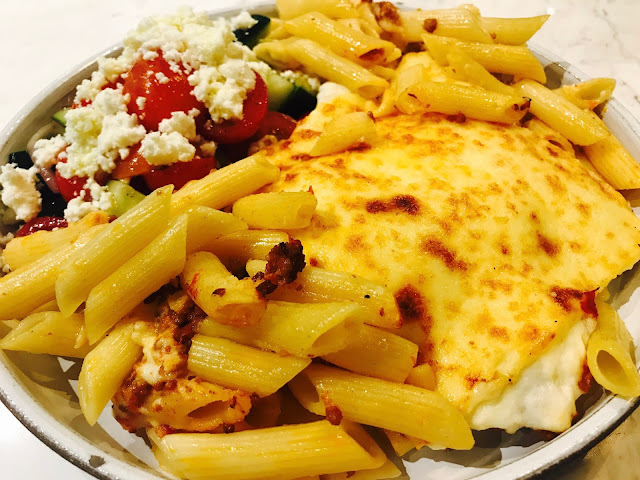 Priced at $14, the lunch specials are a great way to sample some delicious Greek food at economical prices. You can also opt to add on Greek Salad, Quinoa Salad or Green Salad with Almonds & Cranberry for an additional $3. 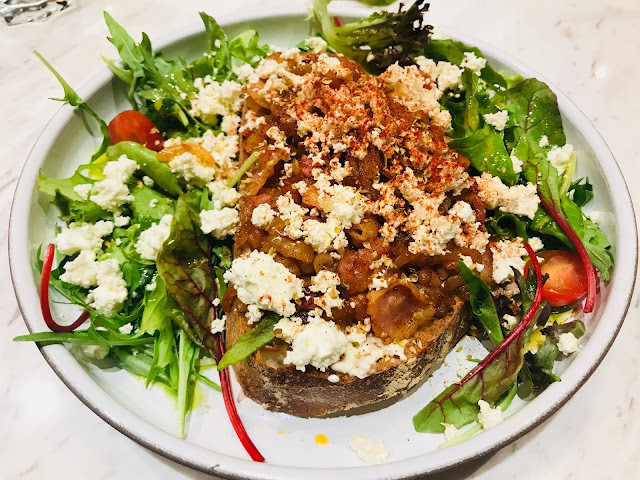 If you are looking for something that is not too filling, try something from the On Toast section such as this “Apaki” Smoked Pork with Feta Cheese Cream & Caramelised Onions on Sourdough Toast [$15]. 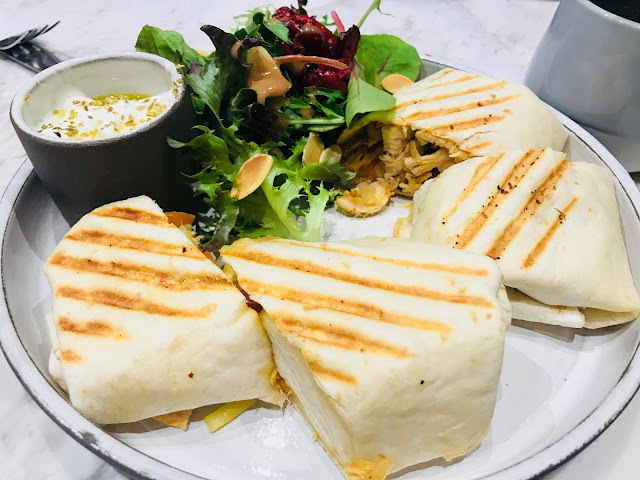 They are very generous with the feta cheese and the creaminess of the feta cheese goes well with the sweetness of the caramelised onions and savoury pork, surrounded by salad topped with more feta cheese. Man, the Greeks sure love their feta cheese. 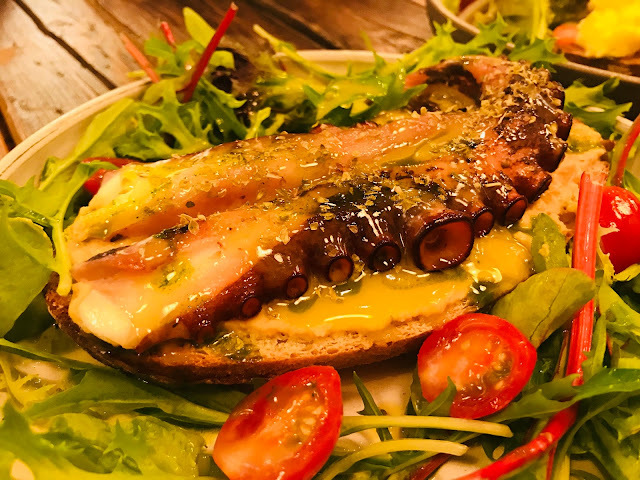 If you are a fan of octopus, you will fall in love with Grilled Octopus on Hummus with OliveOil Vinaigrette on Sourdough Toast [$24]. You get a whole piece of octopus that is super tender. The hummus spread between the octopus and the sourdough toast lends richness to the dish. Surround by a ring of fresh greens with olive oil vinaigrette dressing, this dish is not only delicious but very healthy too. 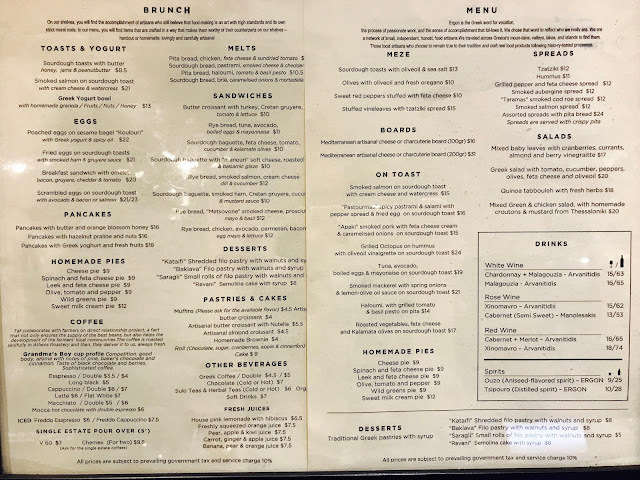 For egg lovers, there is a whole section on Eggs on the menu. You can have your egg poached, fried, in a sandwich or scrambled. I love scrambled eggs so I got the Scrambled Eggs on Sourdough Toast with Avacado & Bacon or Salmon [$21 for Bacon, $23 for Salmon]. 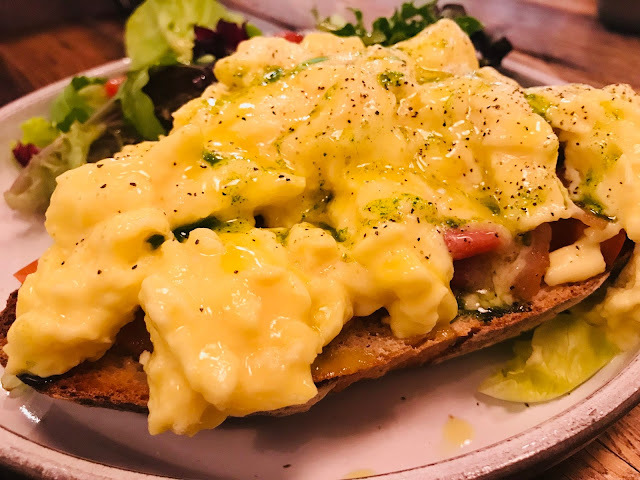 The scrambled eggs are perfect and the salad on the side gives me a healthy dose of greens. 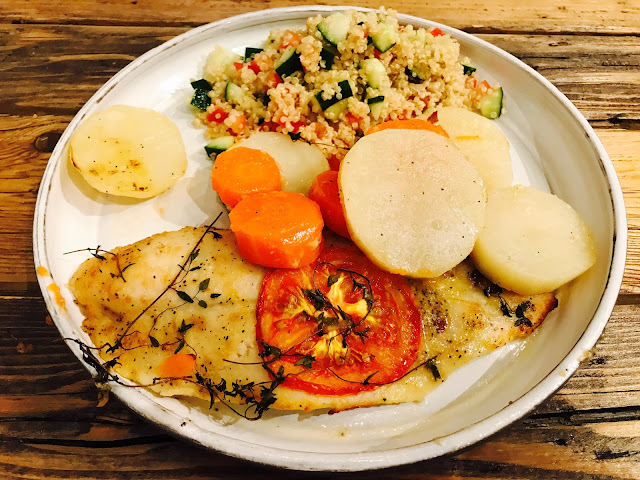 There is nothing exotic about this dish, it is simply comforting food at its best. When in a Greek cafe, try the Greek Coffee [$4.50€, $5€ for Double]. 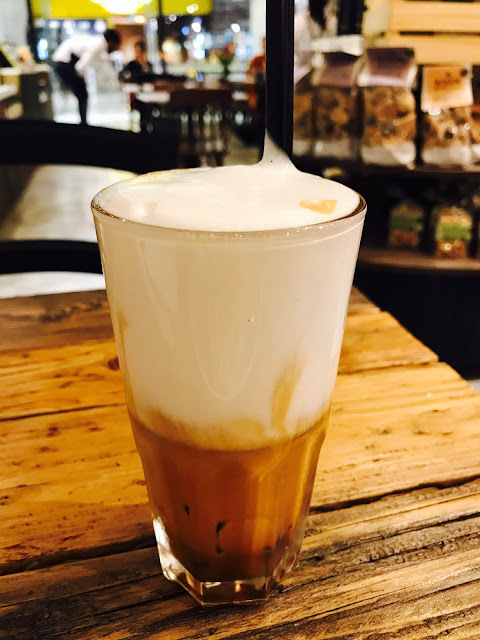 Greek coffee consists of three parts: the coffee grounds, the liquid coffee and the foam (Kaimuki). The coffee is rich, thick and fragrant. 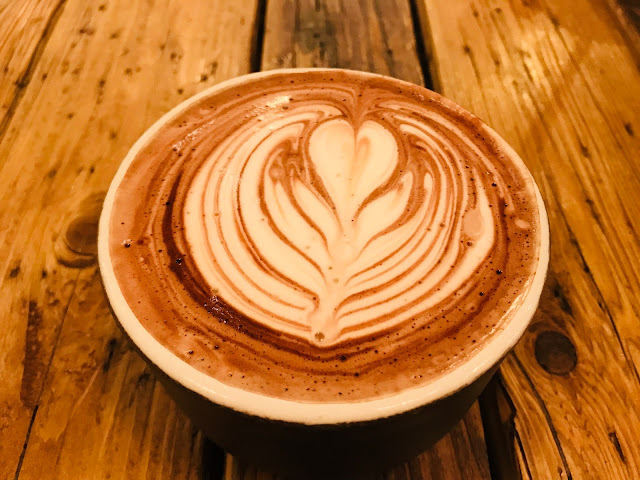 If coffee is not your thing, there is always Chocolate (Hot/Cold) [$7€]. I like that it is not overly sweet, and the coffee art is really pretty. 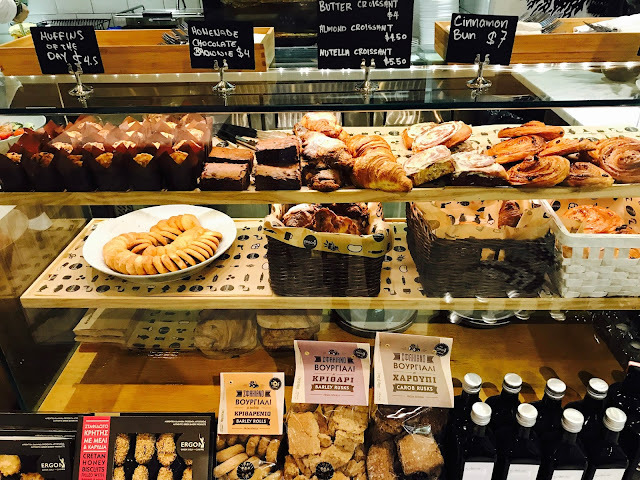 If you need something to nibble on with your coffee or chocolate, there is an assortment of pastries and cakes to choose from. There are Muffins of The Day [$4.50], Homemade Chocolate Brownie [$4], Butter Croissant [$4], Almond Croissant [$4.50], Nutella Croissant [$5.50] and Cinnamon Bun [$7]. 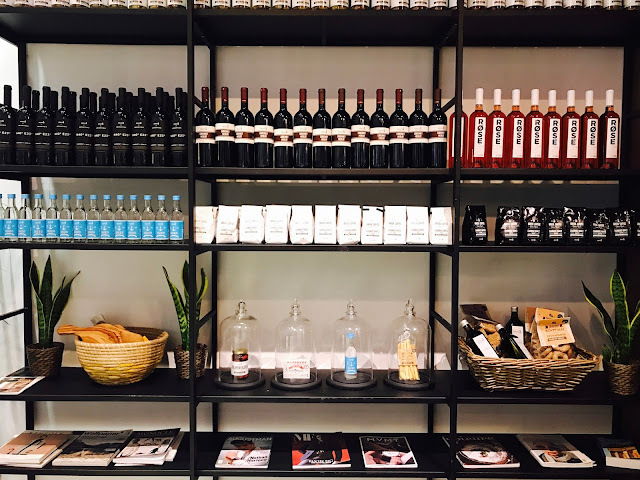 The retail space at the entrance of the cafe sells premium quality Greek products selected from reputable producers. 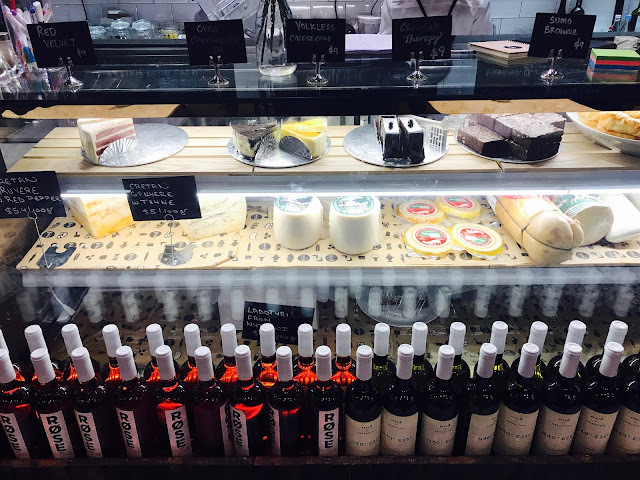 Greek wines, Ouzo (anise-flavoured aperitif that is widely consumed in Greece, Cyprus and Lebanon), Greek coffee, fir tree honey, thyme honey, fish spreads, extra virgin olive oil, olives in a jar, olive spread and feta cheese spread to name a few. You can find ERGON’s complete product list here. ERGON is my first encounter with Greek food and I am totally smitten. Everything tastes so good and the staff are warm and friendly. The prices are reasonable and there are much delicious-sounding Greek produce to take home.